How to work half double crochet stitch. Learn it here! Half double crochet stitch - how to work it! So you want to learn half double crochet stitch? Well - you've come to the right place. Just read through these easy instructions first then have a try yourself! The pictures further down will help you if you're more of a visual learner! Go ahead - have a blast and learn a new stitch today! If you need to learn chain and single crochet first - start here! Well - this stitch is just as its name describes - it's the first half of a double crochet stitch, or half way between a single crochet and a double crochet stitch. Maybe I'm confusing you - let's just get started with the teaching, eh? Start by working a few chains as a base row, then work 2 turning chains. * Start the half double crochet stitch with a yarn over, then push your hook through the 3rd chain from the hook (never count the chain already on the hook). Hook the yarn (or yarn over) and bring it back through to the front of your work (3 loops on hook). Yarn over again and bring that last yarn over through all 3 loops. 1 loop left on hook. Ta-da! There, that's your first half double crochet stitch! You don't believe me? It's true - it's that easy! In fact - check out these pictures just to show you I'm not joking, then try some more by going back to the * and working into the next chain! See - bet you wish you'd learned that a long time ago! It's a versatile stitch with a little more substance than single crochet but it's not as long and open as double crochet. 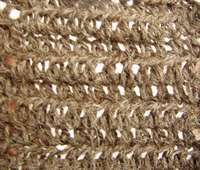 Half double crochet stitch is most often used as part of a more fancy stitch. You likely won't see patterns calling for only half double crochet in large patches. Well - there you have it! See the links below for other stitches you may want to try. Happy crocheting! Learn double and treble crochet here! Try the loop stitch - fun and funky! Learn about other crochet stitch types!